Having just moved to Aalborg, Denmark, I soon made sure to check out the photo outlets in town, both for the pleasure of seeing what kind of gear they stock but most importantly to see if they have black and white films and even better, development service. There are two really, one that does C-41 processing (the standard colour process) and stock normal colour films. Not much of interest, but handy for processing Portra-shots like the ones in the last post. But this post is more about what I found when entering the Japan Photo outlet in Maren Turids Gate. The store was small, high ceiling, lots of stuff but not much of interest until I found a heap of vintage cameras under the glass counter. There were several of the typical post-war rangefinders and point-and-shoots, great cameras, good looking on a shelf but not much useable. A guy came up to me and asked if I was looking for something and I asked if theese cameras where for sale, only to be turned down, they were only for exhibition. We chatted a bit, and me mention a girl coming in one day with her battered old "Leica" who wanted to buy the one they had (as he motioned to a Minolta Leitz CL, not really a Leica-Leica, but called the worlds smallest Leica M). I imediately asked "How much do you want", only to be turned down yet again. Theese cameras are laid to rest, as the mocking papaer cross so clearly states. 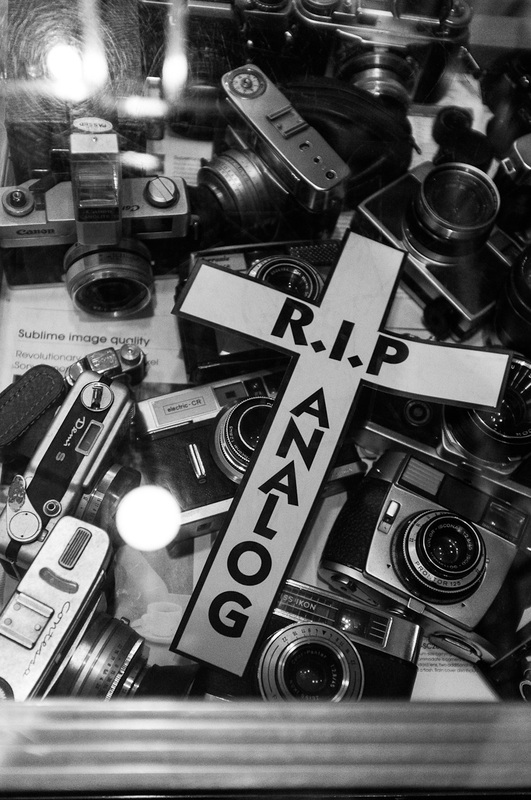 The cameras are on exhibit, the cross is a mocking joke, but I left the store feeling down. In my bag where the CLE my girlfriend has lent me. A CL is on her christmas-list, the CLE will one day die from a electronic failure and the smaller, all mechanical CL will be the best replacement. And there I was, so close to it, and if was confined to a life on display for a store to make a cheap joke on the demise of analogue photography. I am generally saddened my cameras not being used. So many Leicas are doomed to a life on a shelf only because they are rare and expensive, a luxury collectors item, yet they are made to live a life as cameras (while the consumer digital cameras of today are made to make money for the producer and be marvelled at in blog-posts and on forums), taking pictures until they are worn out. Then, and only then can they take a dignified life on a shelf as a monument of a life passed. The other reason I was upset with this store is how they neglect the importance of history. In every field of science I have ever studied, you get into the history of things (short history of surveing anyone?). Analogue photography is photography, the digital era is no more than an adaption, a footnote in the history of photography. Some critics even argue it is not photography at all. Laying analogue cameras and media to rest like this is naivë. Sorry, this is a rant, I understand the store is only making a joke, but it is a provoking one. My message to the is to put a pricetag on their cameras, sell them to the market, realize lightwriters* are still out there and lastly put something else on display, like burned out digital point-and-shoots. Let them rest in pieces. *)Photography litteraly means eighter drawing or writing with light.